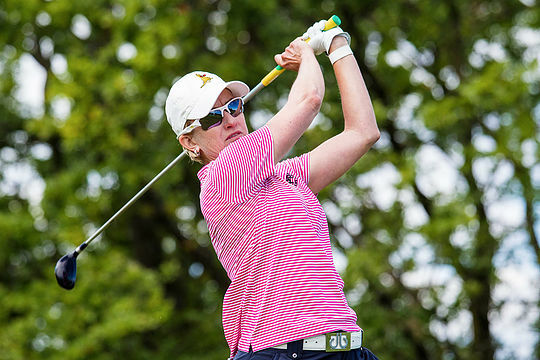 A tie for 46th probably wasn’t enough to get the job done for Karrie Webb. And so her Olympic dreams appear to have been dashed after Webb’s mediocre five-over par finish at the Women’s US Open at CordeValle. Webb knew she needed a better tournament than that if she was to pass Su Oh and earn a spot alongside another of our young guns Minjee Lee for the Australian Olympic golf team at Rio in a few weeks’ time. Even after Oh missed the cut after her rounds of 75-77 at the US Open, Webb knew she had plenty of work to do after her 73-73 did get her through to the weekend. But she couldn’t find the extra birdies needed to get into that top 10 and Webb’s 73-74 weekend finish almost certainly consigned her to the role of spectator at this year’s Games. “I couldn’t cheer against Su, I can’t let myself do that,” admitted Webb. And the reason for that is that the Queensland seven-time major champion actually mentored both the young Aussies who look likely to be our Games’ hopes. In 2013 Lee and Oh were the winners of the Karrie Webb Scholarship, the program Webb began in an effort to nurture young Australian amateur women golfers and turn them into tour stars. Lee and Oh spent a week with Webb at the U.S. Women’s Open that year, with Webb funding the trip and mentoring them. Skip ahead three years and Lee, now ranked 13 in the world, is assured of being at the Games and now it appears Oh, at 39 has enough points to hold off Webb and take that second spot on our team. You might not be now Karrie, but if she’s putting for a gold medal in Rio, you soon will be.